The atmosphere reminded me of those signs in the pub above the Optics saying: “You don’t have to be mad to work here… but it helps”. There was a frenetic, hyperkenetic pace to the whole affair, and any speaker not an ADHDer, of which there were only a few, paid for the slowness of their delivery with the comings and goings of the participants. They weren’t so much booed off, as bored off. Anything went at this conference, and usually it was people leaving the room. At the “ADHD has talent!” night on Saturday, so enthusiastic were the ADHDers with their guitars, poetry, sketches and songs that they had to limit the number of songs and poems because there were too many with too much to say. What anyone who has suffered from Stage Fright or Public Speaking fears could witness, there was no lack of Chutzpah on the stage. So amid all this fairly frenzied activity, with laughter and tears possible in a single session, and tales of prison and substance abuse – for me the Stand Out Most Important speech came from Anthony Reynolds, with his triple studded lip and sunglasses, exchanged today for a suit for the keynote speech. As director of My ADDventure and patient member of the committee, he’d been involved in the new NICE Quality Standards, a fairly bureaucratic sounding document, which I was ready to ignore because the NICE ADHD guidelines had been ignored by our local Sussex health authority. None of the “first line” or “second line” of support that was supposed to be offered to parents – such as parenting courses, mental health nurses, behavioural support groups, were available in our area. Nothing. All there was was medication when my son was diagnosed. But now, these standards, which Anthony had helped to shape mean that over the next two years – by 2014 – the improvements announced in July here http://bit.ly/NICEstandardsforADHD will have to be adhered to. This means every county will have to have an ADHD specialist on hand to make a diagnosis, and specialists – not GPs who often misdiagnose – will be the first point of contact. Obvious, but revolutionary. Also, Adult ADHD is now being put on the agenda, until recently, woefully overlooked – at a heavy price to society (one conference speech estimated that 10% of the prison population are undiagnosed ADHDers). According to Anthony, up until 2006, ADHD was not seen to exist after the age of 18, it just magically “vanished” on the child’s 18th birthday with all the support that went with it disappearing too. As many speakers then explained, the result was a rough ride of self-medication, substance abuse, inability to hold down jobs and relationships, sliding into brushes with the law, prison, or even suicide. But that could all change, now that the NICE guidelines are to change into NICE quality standards. These changes have to happen or NHS trusts risk being fined. Hit em where it hurts. In their wallets. Here’s the main thrust in a couple of bullet points. 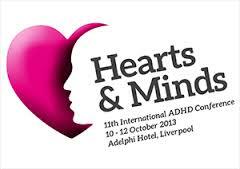 Symptoms suggestive of ADHD are often identified in children and young people by their GP or teachers. In order to ensure an accurate diagnosis of ADHD, children and young people with such symptoms are referred to a specialist in the condition for assessment. Adults with symptoms of ADHD who have not had a childhood diagnosis should also be referred to a specialist in the condition for assessment. This diagnosis requires a full clinical and psychosocial assessment of multiple aspects of a person’s life. It doesn’t seem much, but those Standards could change the lives of thousands and children and adults in this country. If they work. Next Post Why is Negative So Much More Attractive than Being Positive?